Thanks to the efforts of The British Library, The National Library of Russia, St. Catherine’s Monastery, and the Leipzig University Library, you, yes you, can view the Codex Sinaiticus. These four institutions, along with scholars, conservators and curators reunited the entire manuscript in digital form and have made it available for the whole world to read and study….assuming they have internet access. So what is the Codex Sinaiticus? 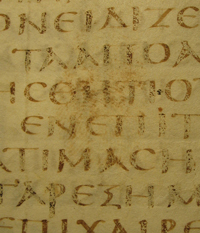 The name Codex Sinaiticus translates to the Sinai Book. 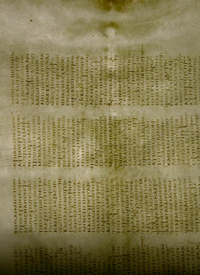 According to the Codex Sinaiticus Project, “During its history – particularly its modern history – parts of Codex Sinaiticus were also known by other names. The 43 leaves which are now at Leipzig University Library were published in 1846 as ‘Codex Frederico-Augustanus’ in honor of Frederick Augustus II, King of Saxony, who was the patron of the German Biblical scholar and editor of Codex Sinaiticus, Constantine Tischendorf. The 347 leaves now in The British Library were previously known as ‘Codex Sinaiticus Petropolitanus’, as they were kept in St Petersburg between 1863 and 1933. Codex Sinaiticus is named after the Monastery of Saint Catherine, Mount Sinai, where it was preserved for many centuries. It is generally dated to the middle of the fourth century. Leaves and fragments of this manuscript were taken by Constantine Tischendorf on three occasions – in 1844, in 1853 and in 1859 – so that they might be published. The principal surviving portion of the Codex, comprising 347 leaves, was purchased from the Soviet government in 1933 and is now held by the British Library. A further 43 leaves are held at the University Library in Leipzig. Parts of six leaves are held at the National Library of Russia in St. Petersburg. Twelve leaves and forty fragments remain at Saint Catherine’s Monastery, recovered by the monks from the northern wall of the monastery in June 1975. So why is this so darn exciting? Think about it, it doesn’t get any older than this. This is THE oldest version of the Old and New Testament kicking around. Through the study of this, people more clever than I will be able to carefully trace the evolution of the Bible and of Christian belief. This is as close to the first person in the Biblical game of telephone as we’ll probably get, and I for one am excited to see what the original text was before it went through 1600 years of ears and mouths. Also, the study of the physical manuscript offers insights into the evolution of books and book binding, and as we established back in May 2008, I think book binding is way cool.